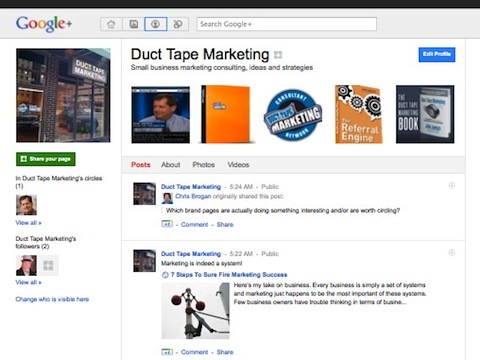 The must talked about and awaited Google+ Brand Pages have finally gone live. Google+ Personal Pages have been with us now since July and many business owners have been waiting for this business only addition. There isn’t anything spectacularly different about the brand pages, but many businesses are jumping in and building a profile. I really thought these pages would be linked to directly to Google Places pages for local businesses, but for now there is no direct connection. You can build circles, although unlike personal pages you can only add people to brand circles that have added you. Claim it – right now there is no valid verification system, so get your Website linked to a brand page right now before someone else does. I know that sounds silly, but anyone can claim to be a brand at the moment. I’m sure that well known brands will suffer a few parody slings before Google figures out how to police this. One Admin – Once you connect an email address with a page you can’t change it and you’re the only one that can edit that page. Google claims that multiple admins is a feature that’s coming, but for now this will be a little clumsy for companies that want multiple folks to contribute to pages. Be Followed First – As stated above the circling function is a bit different. To add someone to a circle in a brand page they must have added you to a circle. This will stop brands from going out there and circling thousands with the hope of getting some circle backs. Multiple Pages – You can create multiple pages, so my guess is you will start to see some product specific or book pages pretty quickly. Direct Connect – Google also unveiled a pretty interesting new search feature with Brand Pages. Now you can search for things using + sign to begin your search and directly connect with a brand’s Google+ page and even add them a circle. Go to Google and type +Pepsi into the search box to see this live.